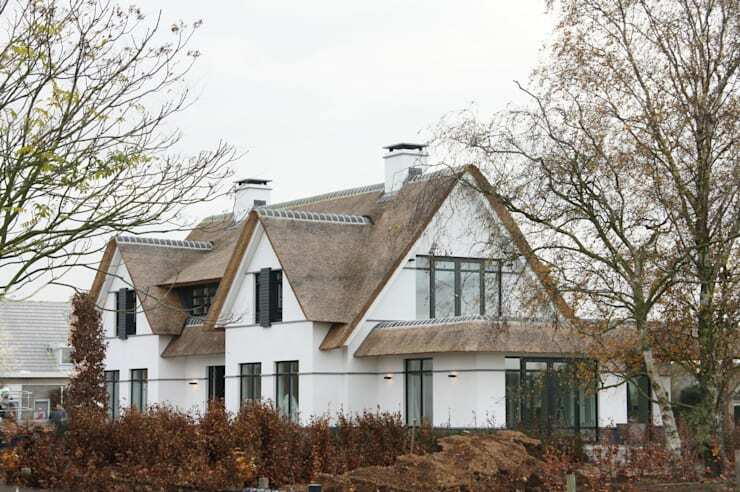 For some the idea of a thatched roof home might be something left for the fairy tales, but for others, this inherent Dutch architecture would be the perfect addition for their home. 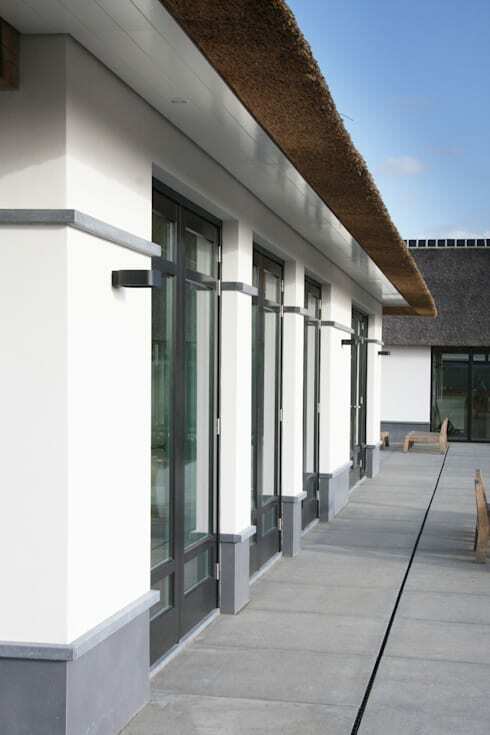 But wait until you see more from stylish modern home, it will definitely get you thinking about including some exciting and creative features such as this roof to make your home more attractive. Who says you can’t mix old-world ideas with modern home features? It’s definitely an upgraded and contemporary take on architecture that has been incorporated in homes throughout the ages. Can you picture this timeless home in a classical movie? The exterior is charming and welcoming, and it’s not just the thatched roof that adds to the character of this sensational home, it’s the layout, greenery and simple use of colour that makes home a fantastic feature on any street. Here we see an image that showcases the traditional style of this country house in its complete splendour. The thatched roof, white walls and quaint architectural features are elegant and luxury, while the country style detail is sublime. 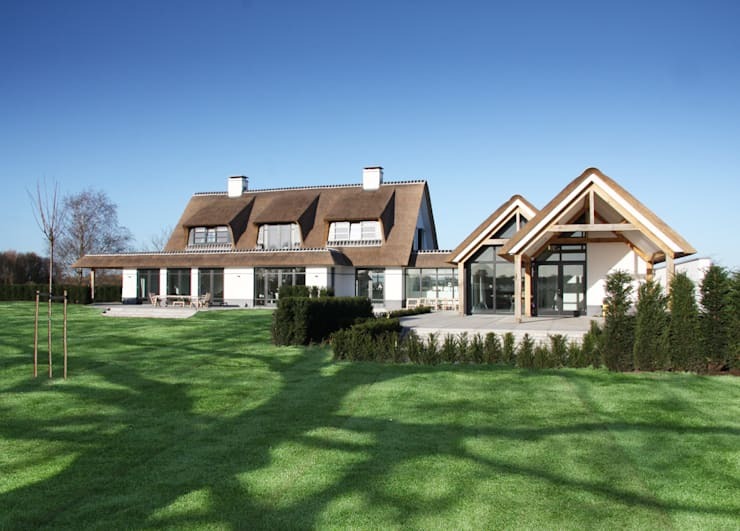 There is something beautiful about a thatched roof home, and it’s no wonder that it is coming back in style. The rear façade of the home gives us an even better view of the combination of modern and traditional Dutch architecture. The pitched roofs are reminiscent of typical farmhouse style structures seen in the country side, but with the sun sparkling down on the home, its picture perfect. The home is delicately integrated into the garden and the colour scheme creates a harmonious setting for this nature loving home. This close up view of the house shows the more intricate details, such as meeting point of the thatched roof and the actual building structure, and therefore displays the merger between modern and traditional design. The interior of the home is linked to a patio area, a great place to enjoy outdoor dining with loved ones. 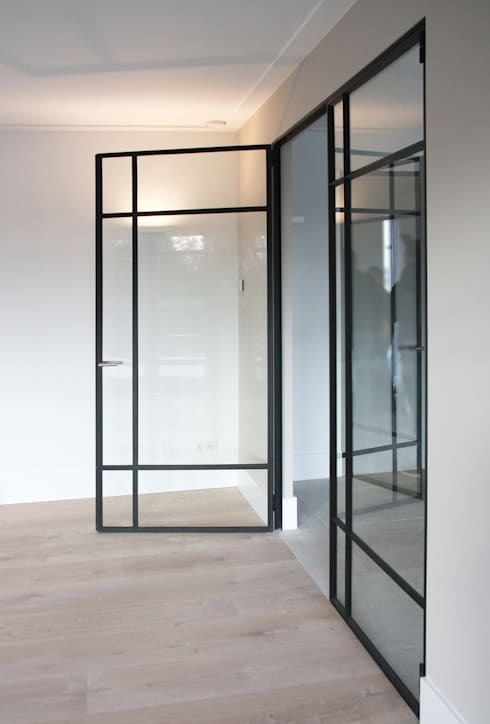 There is something about seamless design that fills a home with natural light and fresh air, the architects of this home opted for glass doors with black metal frames to separate the interior living spaces from the outside. It’s chic and sleek as a design choice, while the frame provides a modern contrast to the neutral exterior architecture. 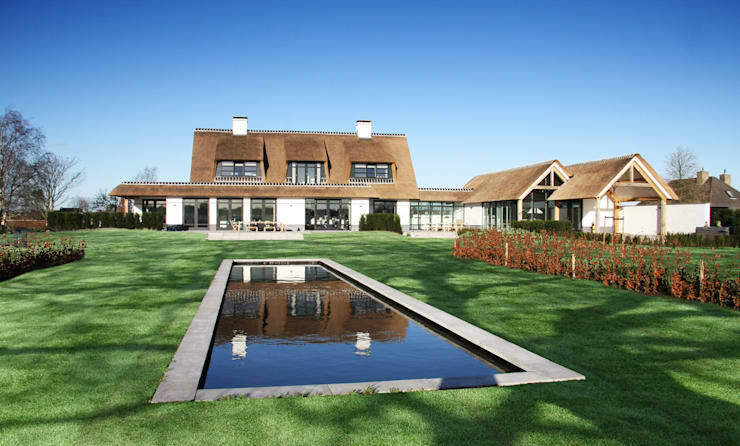 This is our final image of the beautiful Dutch inspired villa, but we needed to enjoy a look at the garden as well. The large green grounds is a great place to host a backyard picnic, while the adorable pond just completes the setting. Enjoy the sound of the trickling water, while the sights and tunes of nature help you to drift off to sleep on a sunny afternoon. For another great country home, Makeover: an ugly house becomes beautiful is awesome. 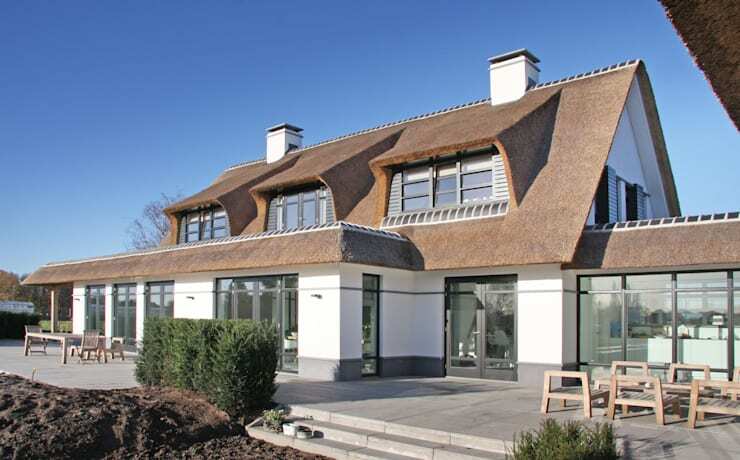 Would you want a thatched roof for your home?